This recipe deconstructs the dish in two parts - steak and mushroom sauce. The steak is marinated in soy sauce and pan seared on the stovetop. Once the steaks are done and removed from the pan, onions and mushrooms are thrown in to sauté, picking up any leftover fond from the steak. A simple sauce is made in the same pan with tomato paste, flour, wine, beef broth and a mustard paste. The steak is sliced and reintroduced into the pan to simmer in the rich gravy. Just before serving, a touch of sour cream and wine are mixed in to give it a nice depth of flavor and creamy texture. Seriously, it's comfort food at it's finest! Pat steak pieces dry with paper towels and season with pepper. Heat oil in 12" skillet over medium-high heat until just smoking. Place steak pieces in skillet and cook until browned on all sides and internal temperature registers 125 to 130 degrees, 6-9 minutes, reducing heat if fond begins to burn. Transfer meat to large plate and set aside while cooking sauce. While sauce is reducing, cut steak pieces across grain into 1/4" thick slices. Stir in meat and any accumulated juices into thickened sauce and cook until beef has warmed through, 1-2 minutes. Remove pan from heat and let any bubbles subside. Stir in sour cream and remaining tablespoons wine; season to taste with salt and pepper. Sprinkle with parsley to garnish. why would you throw out the hot water from the mushrooms and then in the next step use tasteless hot water presumably from the tap? Anonymous - you can certainly use the liquid from the mushrooms in place of the water called for in the recipe. I followed the original recipe as written for the paste but feel free to adapt where you'd like. 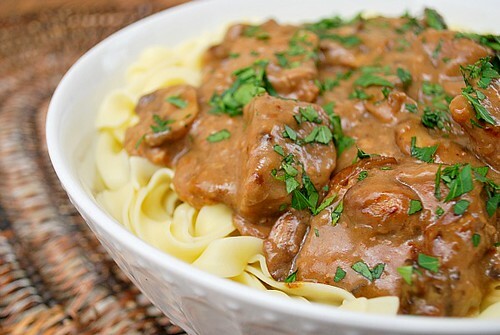 oh i love a good beef stroganoff! yours look mouth-wateringly delicious! This turned out amazingly! Thanks so much! I made this a couple weeks ago and it came out just as good as my Gramps. so amazing! Thanks for the post! I love the recipes you post and this one looks fantastic! I am trying this version tonight. I may have made it before since I have a Cooks Illustrated recipe book. I just made this and it was FANTASTIC. Very much enjoyed! I've looked for years for an alternative to sauce packet sauce. This turned out great! Thank you!